With its nearly constant sunshine and a dazzling array of Hollywood stars, Los Angeles, California, is an striking destination for a family vacation. 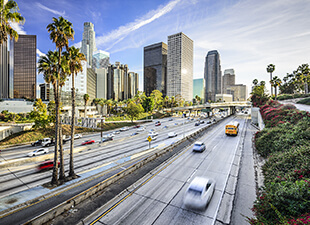 With its nearly constant sunshine and a dazzling array of Hollywood stars, Los Angeles, California, is an striking destination for a family vacation. Reconnect with family while exploring the outdoors or discovering some of the city’s iconic, kid-friendly attractions. 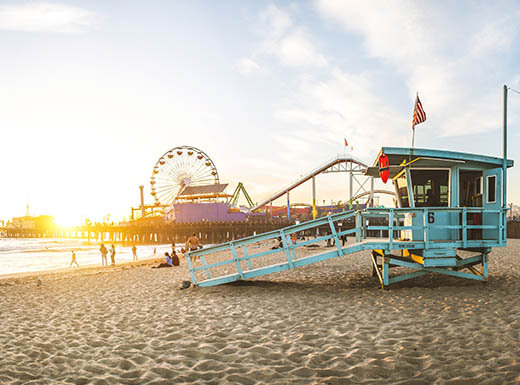 From wild beaches to the heart of the city, L.A. attractions offer plenty of fun for the entire family. Malibu Surfrider Beach: Do you have a surfer or an aspiring surfer in the family? This Malibu beach is the prime place to ride the waves and enjoy a cool, laid-back vibe. Venice Beach: This bohemian beach is perfect for people watching, beachfront biking, and taking in the funky shops that line the boardwalk. Santa Monica Beach: Take some cash so you and the kids can play games and check out the amusements on the Santa Monica Pier, or you can just relax on this bustling beach. El Matador Beach: If you need a break from the crowds, this is the beach to visit. The kids can explore the sea caves while you relax on this beautiful stretch of sand just north of Zuma. 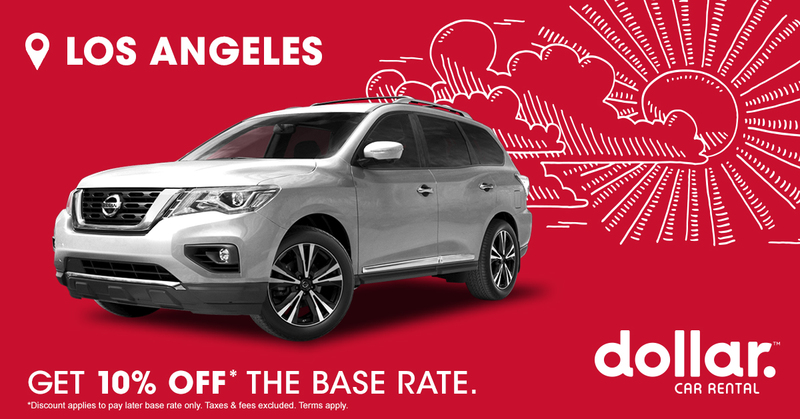 There’s more to the City of Angels than sunshine. 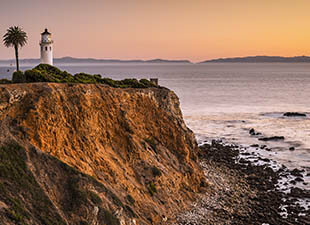 It’s a cultural hub with family-friendly institutions like California Science Center, with its IMAX theater, space shuttle Endeavour display, 188.000-gallon tank of kelp, earthquake-proof structure, and hands-on exhibits that are fun for the entire family. At the Getty Center, adults and older kids enjoy stunning views of the city skyline from this renowned art museum’s hilltop perch while younger kids explore activities in the family room. Whether your kids are small or in their tweens and teens, Hollywood attractions add magic to a California getaway. The Hollywood Walk of Fame is the place to stroll along a path with more than 2,500 stars’ names while checking out the costumed characters and street performers along the way. Hollywood & Highland Center takes malls to another level. Go bowling, make your own chocolate, or tour the Dolby Theatre. Oh, and you can also do your typical shopping there too. Tour Warner Brothers Movie Studio to see where movies and television shows like “Friends” and “Gilmore Girls” were filmed. If you’re lucky, you might even snag tickets to a live taping of a current show. You might see some movie stars during your visit to Los Angeles, but you’ll also have a chance for some real stargazing. 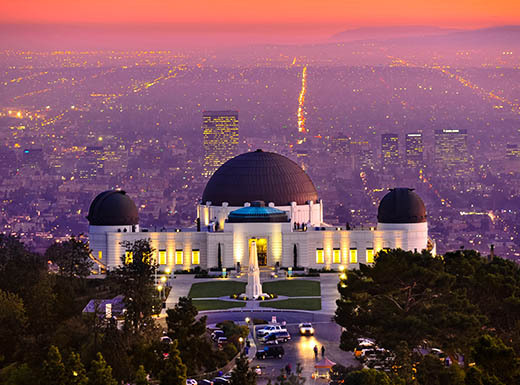 The city is home to several planetariums, including the iconic Griffith Observatory, which features live shows, telescopes, and fascinating exhibits. It also offers access to the 4,000 acres of Griffith Park, where you can hike, bike, and enjoy amazing views of the Hollywood sign. Part of what makes a family vacation so special is the opportunity to reconnect with each other. Los Angeles’ expansive parks give you a great excuse to power down your smartphones and spend some time away from the screen. 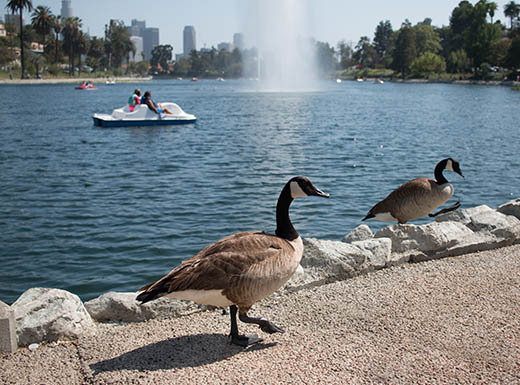 At Echo Park Lake, you can rent pedal boats to explore the lake and take in the city views. Grand Park is situated in the heart of downtown and offers 12 acres of fun, complete with a splash pad and a playground. 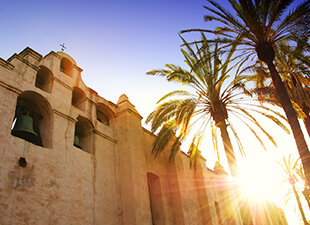 What are you most excited to see and do on your family vacation in sunny Los Angeles? Check out Twitter to share with us and discover more travel inspiration.